Here is my little two month old gnome. My friend from my crochet group knit this hat for me when she heard Blake's nursery was forest/gnome themed. 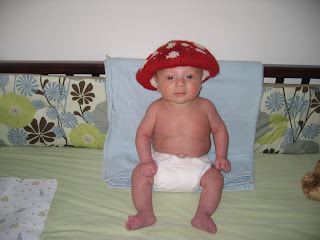 Right now the hat suits him perfectly, but I look forward to wearing the mushroom hat in the winter. It is the softest yarn too. 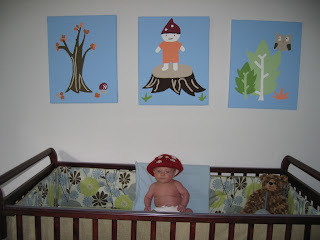 Here is another view of Blake the nursery gnome. 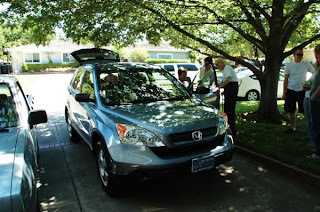 Two weeks ago, we drove up to Sacramento to visit my parents. My mother is now rolling in a 2008 Honda CR-V. We are all excited she has a new car and Blake loves the idea of eight air bags and the Latch system. Isn't it shiny and new! 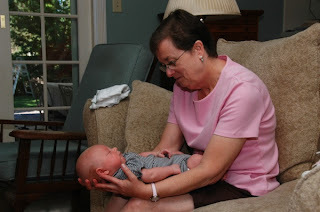 Here is Grammie loving up her grandson. Carl and Lisa admiring the new car and the baby. They brought Blake his first motorcycle outfit to wear when Uncle Carl takes Blake out for his first ride. This last weekend, we all drove to Oakhurst for the Memorial Day Weekend. We bought him his first swim diaper and he couldn't use it because it rained the whole time. The pool had been about 75 degrees for a while before the rain so we were sad he didn't get to go swimming. He has many pool days ahead of him though so no worries there. 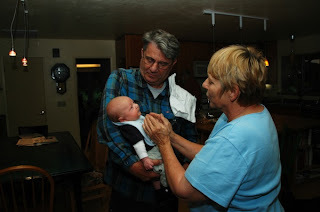 Here is Grandma Ellen holding Blake. Grandma and Grandpa working as a pair as they love up on the little guy. Blake knowing he is in good hands. 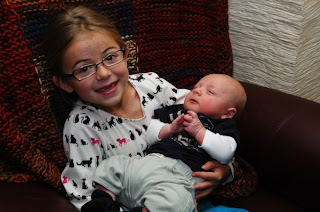 Cousin Mia took great care of Blake the whole weekend! She is a natural born babysitter/future mommie. What a diaper changing pro. I knew she was super already, but now I really wish she lived down the street, for I could use her help everyday. 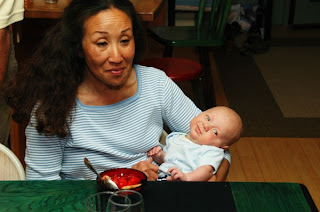 Great aunt Karen keeping Blake happy. 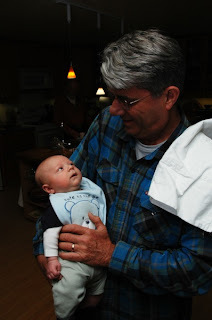 Great uncle Glen taking care of Blake after dinner. With all this help I could have done my laundry, painted the house, and crocheted us all sweaters, but since I was away from home relaxing was my priority. Mia brought her babies over to play with Blake. 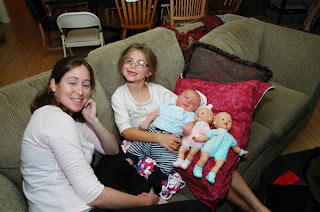 I couldn't believe how much energy Mia had to take care of Blake after taking care of her twins all day long. Everyone meet Diamond and Hazel. 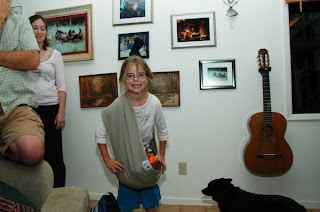 Mia is wearing my New Native sling with all of her babies (some human, some animals). 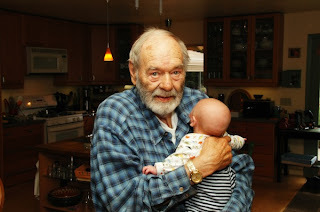 Eventually, Great Grandpa Walter had to steal Blake away from all the chaos for some strong and calm recentering! 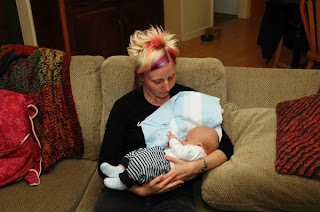 Auntie Jessica always provided a great lap and even gave him some video game pointers. Oh, only when she wasn't tickling his Westersund big toe (notice he is protected with socks here). Blake needs to eat and grow so he can go mountain biking with the big boys. We forgot to take an "after" picture when the two of them were covered in mud once they got home. Well so far these past two months have been amazing and I can't even remember the tough times. I love hormones for that reason. Blake had his two month doctor's visit today and was brave through his shots. The doctor called him a moose and said I was doing a great job breastfeeding. I asked if he is going to go through a growth spurt because he is eating so well and he replied saying that Blake may not show signs of growth spurts because he looks to be a great eater and will just continually grow. Just like his daddy as a kid. Cheers to a healthy and happy baby. What great pictures and story. 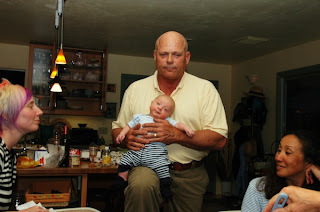 I loved seeing dad and David holding Blake. My favorite is looking over my shoulder, how sweet he looks. 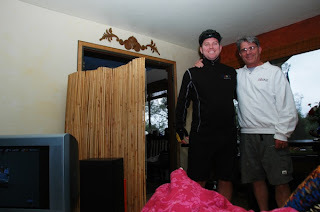 I was wondering when we would get a shout out on your blog. 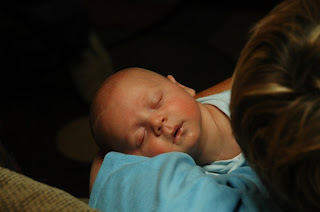 Blake did have his fist photo shoot with me posted on my blog too!